“Building-to-street proportion is the relationship between the height of buildings on either side of a street and the width between those buildings. An ideal proportion between these two creates a pleasant and visually interesting public realm. The public realm, therefore, may be considered as an “outdoor room” that is shaped by the “walls” of the building heights and the “ floors” of the roadway. Our city, with its sprawling boulevards and speeding cars, is often cursed with roads way too wide for pedestrians. 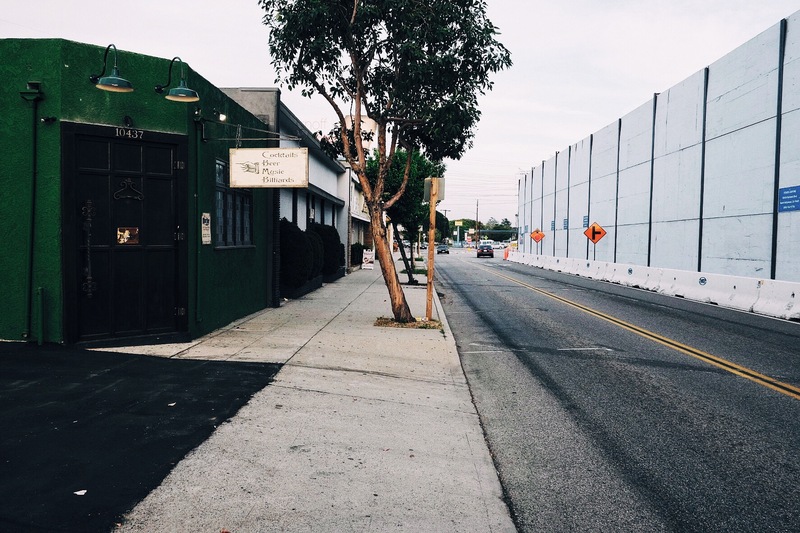 Think of six-lane Van Nuys Boulevard, bordered by one-story high buildings, and worse, parking lots. 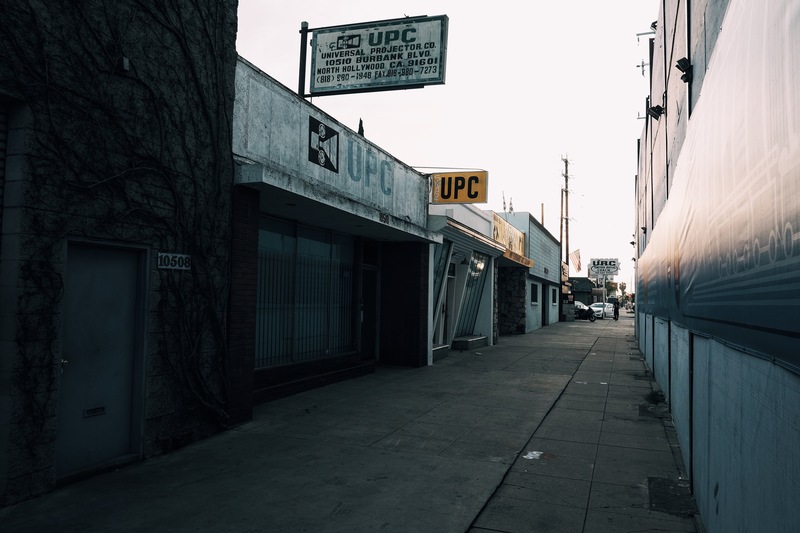 In some areas of the city, like on Pico Boulevard and in Studio City along Ventura Blvd. planted islands with trees now break-up the wide asphalt. New “outdoor rooms” with a sense of enclosure and protectiveness emerge. These are deliberate and designed for upgrading ugliness. 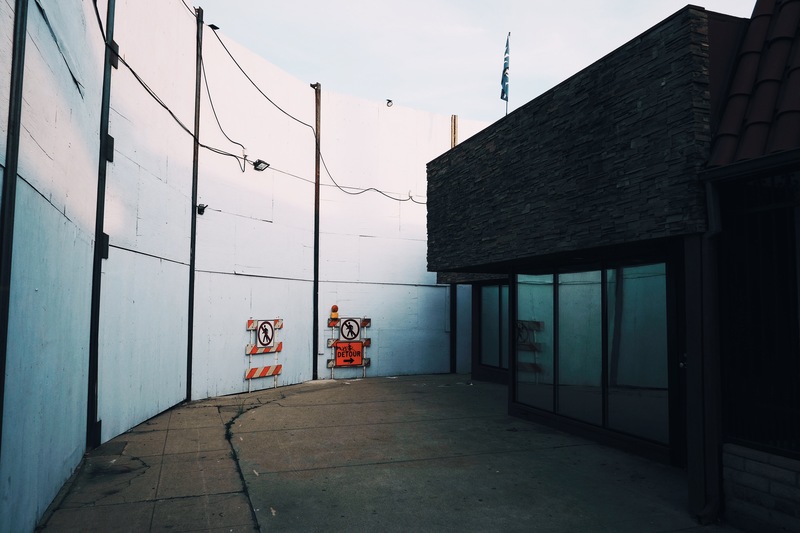 But sometimes even an ongoing construction project can enlighten and transform a bleak stretch of formerly wide street monotony. In North Hollywood, on Burbank Blvd. just east of Vineland, DWP has been tunneling and installing a new water delivery system. And along part of the route where a deep, underground hole was dug, DWP erected 20-foot high, wood and metal-framed walls. It has temporarily transformed the commercial district of that area by slicing the four-lane road into a two-lane and creating, along the sidewalk, a European type shaded alley. 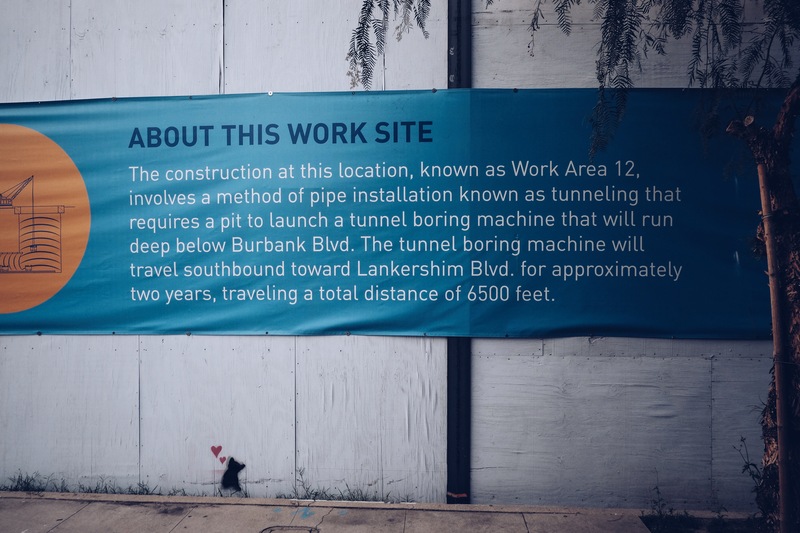 Work Area #12, as it is officially known, requires a pit to launch a tunnel-boring machine that will travel south, along Lankershim Blvd. for more than a mile. A new water pipeline will replace the aging 1940s infrastructure. 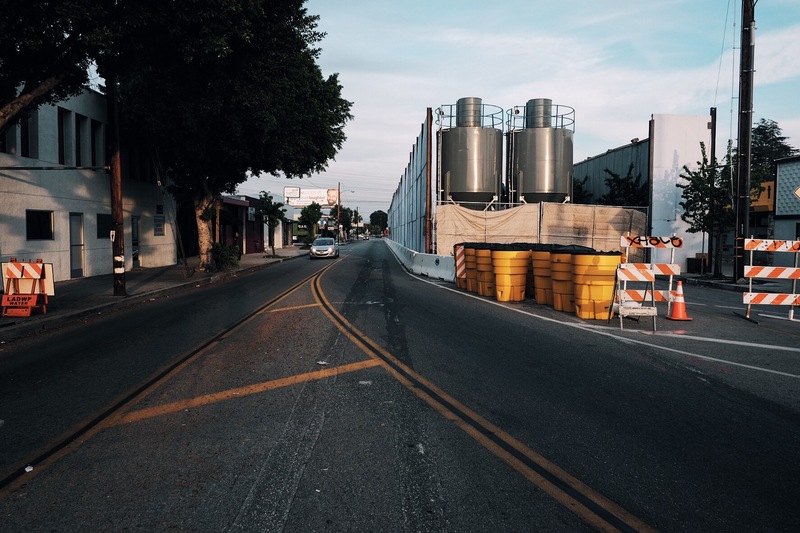 While the construction is going on, some streets have been closed off, which no doubt contributes to aggravation and inconvenience for some area residents and businesses. But the rerouting and reconfiguration has some pleasant side effects. On Burbank Blvd. cars now stop twice, before proceeding slowly, down a narrow road whose borders are shaded by high walls and low buildings. On the western edge of the excavation, two tanks tower above the road, as if heralding a ceremonial gateway into the neighborhood. And on the south side of the street, the high walls come right up to the sidewalk, creating a shady and meandering path alongside area businesses. 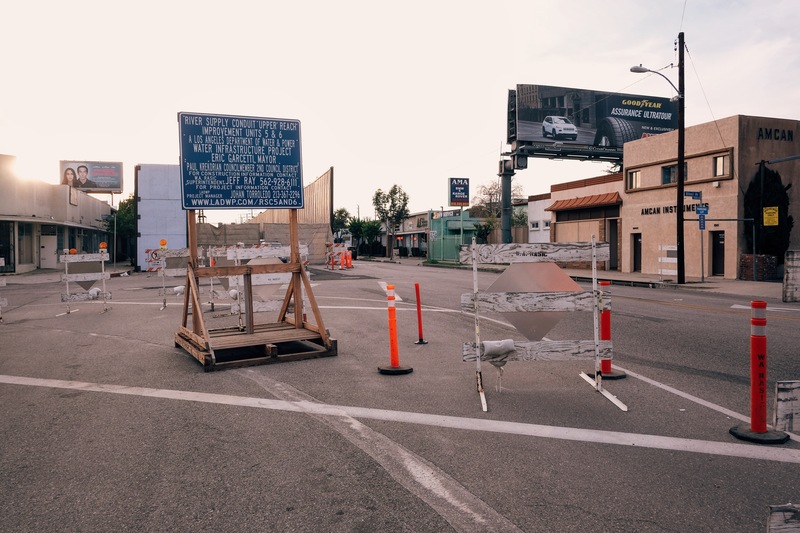 The gift of this unwelcome intrusion allows us to experience a different LA with traffic calming elements. What emerges? Less cars, slower drivers, shaded walkways; walled off from the exhaust fumes and the aggression of speeding motorists. Industrial construction materials in steel, wood and concrete function as street sculpture. 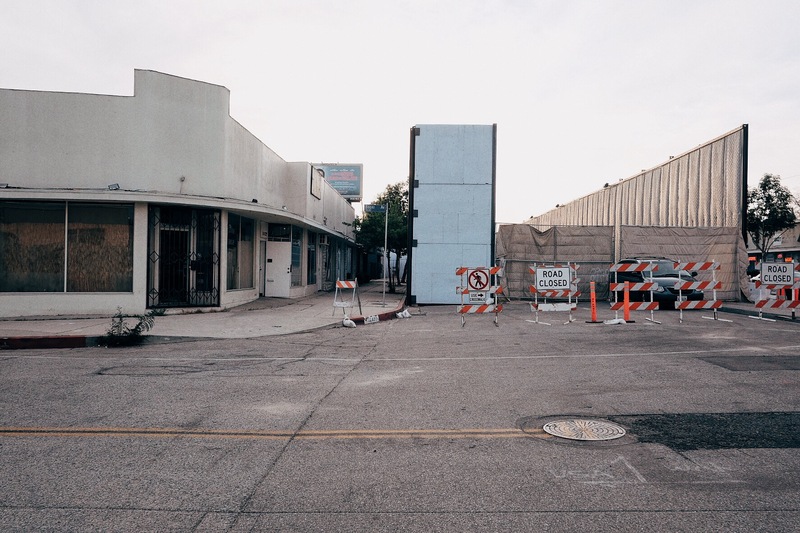 For the time being, a stretch of Burbank Boulevard is a living experiment in rezoning by accident.